Over the years, the group moved from being protesters to being partners, working with local and central government, businesses in the area served, train operators and the rest of the rail industry, other user and community groups. As we shifted from protest to partner, we formed the "TransWilts Community Rail Partnership". Initially TransWilts worked as a group working within the community, then with First Great Western (now GWR) support, adding Wiltshire Council and central government though a Local Sustainable Transport Fund (LSTF) grant. Once the service was up and running on a trial basis, TransWilts was able to join ACoRP (the Association of Community Rail Partnerhips) - a Department for Transport sponsored organisation to help put new life into local lines. And as the service became permanent in December 2016, the service has become "designated" with gives the partneship some further authority / input, in particlar allowing local variation of national standards and policy where that works for the towns served. Passenger journey numbers to, from and through Melksham - that's the line section unique to the TransWilts - were about 18,000 per annum when we started and are now up to a quarter of a million. 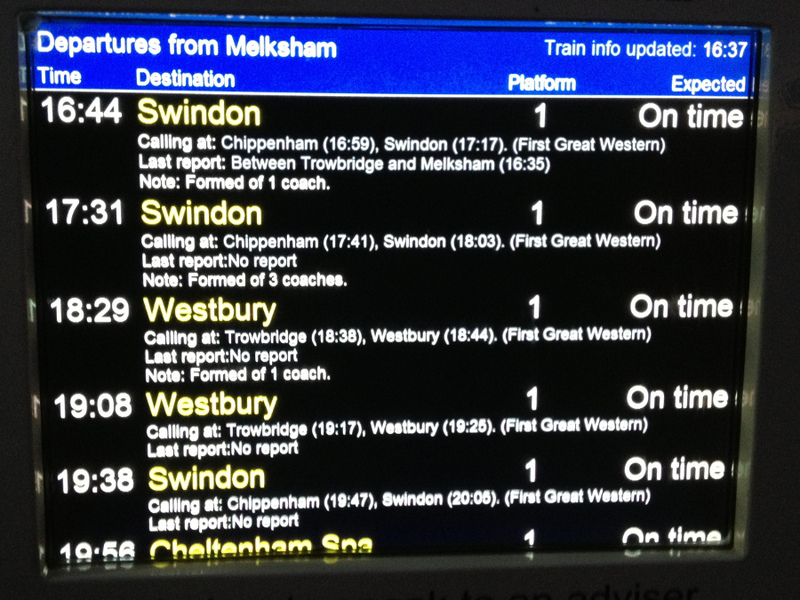 Train service is up from 2 each way per day to 9 each way per day, passenger journey numbers at Melksham Station up from 3,000 per annum to around 60,000 per annum. The original trains still run - but where they had 2 or 3 passengers they're now conveying up to 30, and some of the new trains are full and standing (but if you're a potential passenger, there's still room for a few more on board). There's still campaining and collaboration work to do - modelling suggests that Melksham passenger journeys can rise 5 times more to around 300,000 per annum - and for that we need a longer platform (project underway), longer trains (also underway) and more of them. And we need to improve access to Melksham station away from the tracks, and get the town's bus service to connect with the train rather than ignoring it. Yes - the campaign has been successful - but that very success tells us that we're not where we should be yet and need to keep working for more and longer trains - and indeed link them into other trains beyond Westbury to Salisbury, and to Southampton and the airport. An appropriate TransWilts service started yesterday. 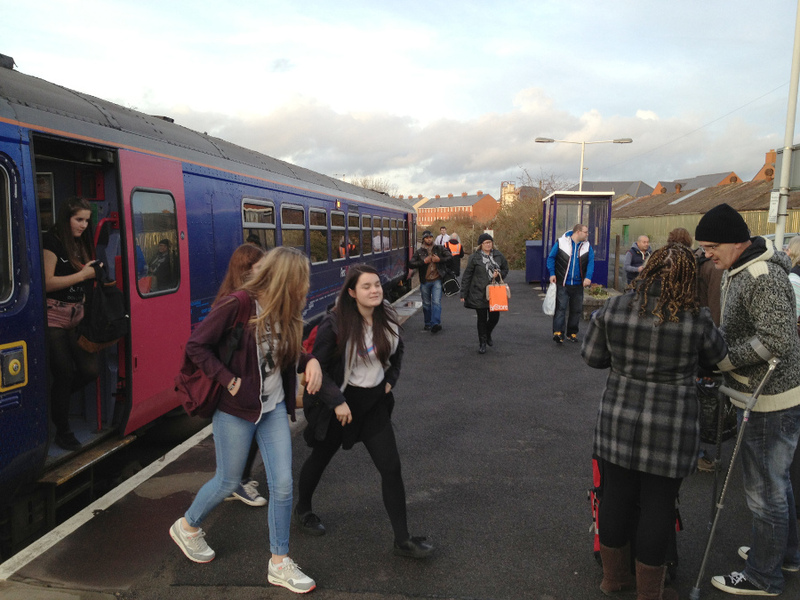 There are now 8 trains each way from Swindon to Westbury, and eight from Westbury to Swindon, on each weekday. And 5 one way, 6 the other on Sundays. Please visit the TransWilts Community Rail Partnership for details and our passenger forum for discussions. ... and those were real users, there to travel. But we now head into phase four of the service ... that's to have it flourish and retain the service, and that's going to be harder work than getting this far, but much more rewarding as the rail industry, the local councils and the community are all working together! • To support the rail industry and Government in making that service work, so carry on. We're nearly there now. This update is written in September 2013 and there's a service of 8 trains per day, each way, on the National Rail timetable from 8th December. The "Save the Train" folks moved on - quite a while back - from being a campaign group (as we had to be for the first two phases) into a support group ... and you can now find details of the TransWilts line at the web site of the TransWilts Community Rail Partnership. Our popular discussion forum spawned the First Great Western Coffee Shop where you'll find TransWilts - and many more issues too - discussed. June, 2012. The Department for Transport announces 4.25 million of support for Improving Wiltshire's Rail Offering - an LSTF bid by Wiltshire Council, who are committed to local seed funding to get a two-hourly service up and running. The LSTF monies deal with other vital, linked improvements such as access to stations and information systems. The team who were heavily involved in campaigning under the "Save the Train" banner are closely working with businesses, local government and the rail industry to help ensure the the opportunity offered bring maximum benefit to all, as part of the TransWilts Community Rail Partnership. Much work still needs to be done - see the Community Rail Partnership's site for continuing updates. This site will remain available as an archive, with just occasional updates to this "STOP PRESS" box. "Save the Train" was set up in 2005, in answer to a threat to the train service on the TransWilts line, which was to be cut back the following year, and we feared that this would be just a step towards the total loss of the direct train service linking Swindon and Chippenham to Trowbridge, Westbury, Warminster and Salisbury, and to the closure of Melksham Station. • to ensure that the service regained is retained. We have come a long way forward. In those dark early days, we were told that the line was a "no-hoper" and that we were "just passengers who don't know how difficult and complicated railway matters are" (which did have an element of truth). But we learned and we studied, and time have changed too - and with those changes the line has moved up to being the best case in the South West for a dramatic improvement - with a service of one train per hour in each direction, the line shows a Benefit Cost ratio of 1.7 which justifies the case. But there's a huge difference between theory and practise, and the figures need validating and detailing - just where are the traffic flows that would be handled by such a service, where would it work, and who will supply the seeding funds to get it off the ground, and the mechanism to transform the benefit gained into hard cash to pay the train operator? 1700 people signed our Prime Minister's petition. Some 800 have pledged their specific support for our 2010 service request - over three quarters of whom live in Wiltshire. There are people who'll gain from a 35 minute direct train journey from Trowbridge to Swindon rather than 95 minutes on the bus or 55 in a car - and we want them to help us turn theory into practise. There's work involved in gathering data. There's publicity needed. There's the current service that offers some excellent travel opportunities - and there's much more. It's early days [yet] - writing this on 2nd March 2010, we are exploring with a few key players what would and would not work to come up with the best, inclusive proposals. Big launch - 26th March (Keep that evening clear in your diary). If you want to see what some other Community Rail Partnerships are up to, have a look at The Heart of Wessex and Three Rivers - both of which are doing a great job, and both of which neighbour us. Now is the time to set up such a partnership for the TransWilts. Looking for our old front page? It's here! 404, The Spa, Melksham, Wiltshire, SN12 6QL. We're moving forward. The old pages are archived (you may link to them through the "Old Home Page") ... but we hope you'll move forward with us rather than dwell too much on the past.